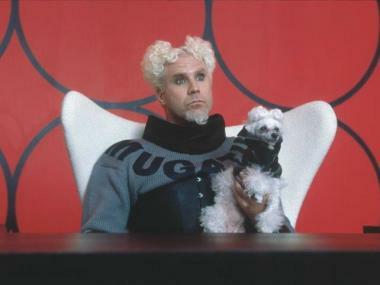 Will Ferrell plays Jacobim Mugatu in "Zoolander." LOWER EAST SIDE — We're in a glass case of emotion. Stay Classy, a bar that opened last year themed around Will Ferrell and his many beloved characters, is set to close its doors at 174 Rivington St. this week as the owners plan to take their concept on the road. The watering hole — which is decorated with Ferrell memorabilia and offers drinks named after his films and famous catch phrases — will shutter and instead became a pop-up bar traveling to cities across the country, according to owner Zach Neil. "The experience has been great, we're not closing because it's not great, we're closing because we are actually franchising. We are taking this on the road," said Neil, who just wrapped up a 10-day pop-up in Los Angeles earlier this month. "Initially when we opened in New York, we kind of felt like it was a pop-up — we kind of said we're going to do this until it gets old or people stop coming," he said, saying that while the bar still gets crowds, they thought it would function better as a temporary project. "To keep that space operational as kind of our flagship just didn’t make sense for us," he explained. In the coming months, Stay Classy pop-ups are set to launch in Boston, Miami and Philadelphia, and will return to New York City at least once a year, according to Neil. But the owners — whose other projects include a Tim Burton-themed bar in the East Village — have new plans for the Rivington Street location. "We're going to be doing something completely different," said Neil, who said it was still too early to divulge additional details but that patrons should expect the new business to open in February. In the meantime, Stay Classy fans can say their farewells Friday and Saturday, when the bar will open for its final hours. The Lo-Down first reported on the closure. During more than a year in business, Neil said the space drew an even mix of both locals and tourists, as well as visit from the bar's namesake, Ferrell himself. "We had young people, old people — it was kind of a mishmash of anybody who liked a Will Ferrell movie," Neil said. "The concept in general was just such a fun idea, people would go in there just to kind of see what it was all about."